Ahmed Abdul-Malik, bass; Roy Haynes, drums. This album captures the exciting core of an evening's performance by a unique jazz group at an unusual club. The group is unique simply because any jazz unit led and molded by Thelonious Monk deserves that adjective; the club is unusual because, as a casual bar deep down on New York's East Side, it contrasts sharply with the formal chicness or the alternative high-pressure pseudo-hipness of most of today's jazz spots. And, when the future jazz histories are written, the combination of Monk and the Five Spot may go down as one of the imprtant legends and landmarks. For it was in this club that Thelonious spent the vast bulk of his working hours during 1957 and 58, years in which the critics and the jazz public seemed finally to be making themselves fully aware of the vast significance of Monk's role in jazz and also of the great vitality and sheer enjoyment value of his writing and playing. The Five Spot association comes along relatively late in Monk's career and in the life of modern jazz; but the fact is that Thelonious for years operated in an unwarranted semi-obscurity, built in part out of the genuine complexity and difficulty of his music, and in part out of the way run-away press-agentry and rumor had exaggerated his "mad genius" aspects. To a large degree, Thelonious molds any group he leads into his pattern; but it is important to recognize that the pattern he builds for a particular group comprehends and utilizes the specific values of the men with him. The original quartet, with John Coltrane on tenor; Wilbur Ware, bass; Shadow Wilson, drums, had never been recorded as a unit because of various contractual complications. The present group is of course not the same, nor does it sound the same, nor could it. Monk is a constantly changing artist. Aside from the basic fact that both are modern tenor men of outstanding talents, Johnny Griffin and John Coltrane are not the same man, and Monk is fully aware of this. 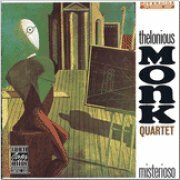 Whether a particular listener likes one or the other "better" is quite beside the point; the point is that this group is the Monk quartet with Griffin, and its approach, style and even repertoire clearly show that. Thelonious In Action, 1958, Riverside. This is Thelonious Monk's eighth Riverside LP. Like all its predecessors and, undoubtedly, like the recordings still to come from the mind and hands of this remarkable artist, it offers several aspects--though hardly the full picture--of his distincitive talents. There are re-workings of his earlier compositions (it should be axiomatic that Monk is a constantly self-renewing composer-arranger-musician, that each new recording of an "old" number, particularly with different personnel, represents a fresh view of it--almost a new composition). There is one new piece: "Blues Five Spot." As that title emphasizes, this album (like Thelonious In Action) was recorded on-the-spot during Monk's 1958 engagement at New York's coloful Five Spot Cafe. Thus there is also a brief unaccompanied version of a standard ("Just a Gigolo"); characteristic of the way Thelonious opens most of his sets in a club. The title selected for this album--Misterioso--is more than just the name of one of its numbers. It is an extremely Monk-like song title, evoking by its mild play on words (linking "mist" and "mystery") another basic characteristic of his music at this or any other time, that feeling of challenge and depth that leads a writer like Gunther Schuller to describe Thelonious quite aptly as "enigmatic and wonderful." The featured sideman on this recording, as he was during virtually all of Monk's mid-1958 Five Spot engagement, is the exciting young Chicago-born tenor man, Johnny Griffin. Griffin, who was first brought to Riverside's attention by Monk, has appeared frequently on this label both as a sideman and as leader of his own groups.